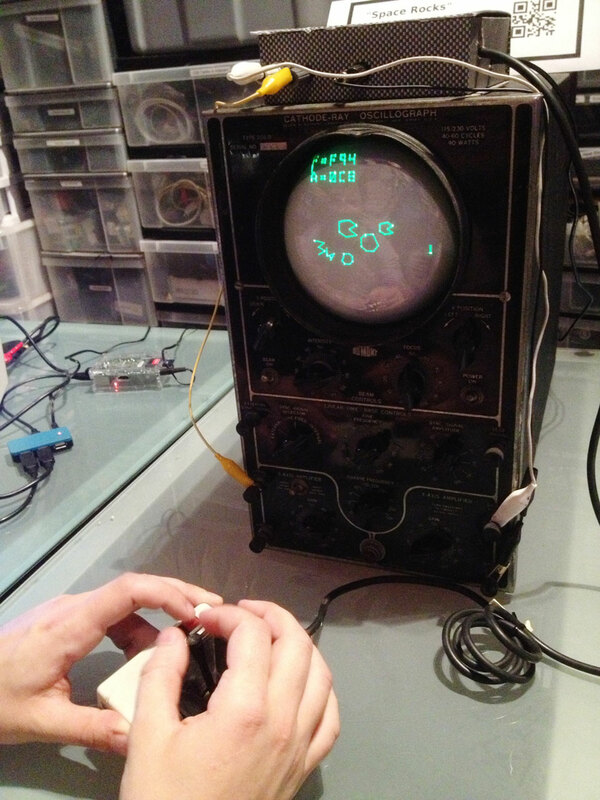 The folks at Brooklyn hackerspace NYC Resistor rescued a 1940s DuMont Labs 208B cathode ray oscillograph from the side of the road, and Trammell Hudson is driving it to do fun things with a microcontroller. First up, he used this vector-based Asteroids font library to create a authentic 1940s-era Twitter client displayed on the classic scope. While the Delta-V of the simulator space craft was optimistic for its era, the basic acceleration, velocity and position model is reasonably accurate. If the ship passes too closely to one of the space rocks, it is destroyed and the simulation restarts. Once the ship runs out of fuel (measured in hexadecimal in the upper left corner since the CPU can’t perform a DIV/MOD operation fast enough to display decimal numbers), it is stranded and unable to continue its mission. Space Rocks runs off a Teesny board with code that’s available here. It has made public appearances at the NYC Resistor show in June, and at NYC MakerFaire in August. Check out the writeup on the NYCR blog for video and more.